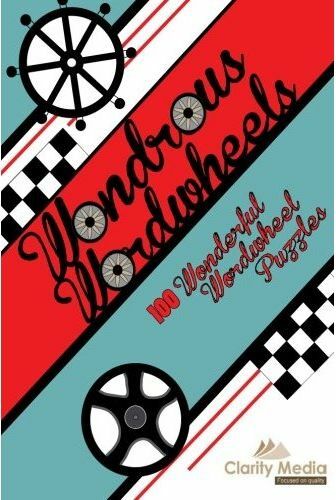 The book of wordwheels (Volume 1, 2, 3, 4 & 5) contains 100 fantastic wordwheel puzzles for you to enjoy. To the right you can see the cover of the book, and beneath it one of the pages of the book. 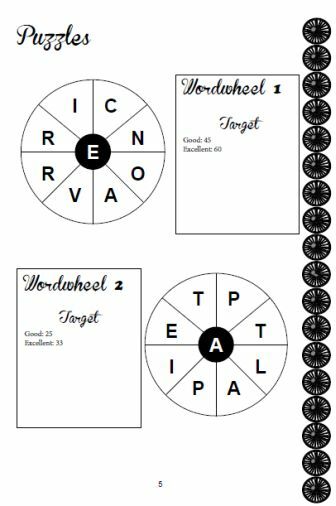 Wordwheel puzzles are great for testing and building your vocabulary - not sure if a word you come up with exists? Then just look it up in the dictionary and find out if it does exist, and if so what it means! The book has two puzzles per page, printed on very high quality paper and there are also two targets for each wordwheel: one is a 'good' target and the second is the 'excellent' target. There is also a list of solutions at the back of the book for you to see the words that could be made from each wordwheel. We hope you enjoy this collection of 100 wordwheel puzzles - do let us know how you get on! We receive questions from wordwheel fans asking what the best way to find words is. The question is perfectly fair, but answering it - well, that's a little harder! The first requisite, clearly, is a good vocabularly - because without knowing lots of words, you are never going to find them. And one of the joys of wordwheels is the fact that you can learn as you go along: not sure if a word exists? Look it up, and if it does, try to remember what the definition is. We know of solvers who have learned over 100 words this way and take great pleasure in using them in their everday lives, particularly interesting or quirky four or five letter words that hardly qualify as 'big' words but are more impressive than many! In terms of actually how to find the words, then the simplest approach is probably the systematic one. This means that you start with a given letter, and try to find every word that you can starting with that letter. So, looking at sample wordwheel 1 to the right, you might start with the 'V' then try to find as many words starting with it. Then once you have exhausted that letter, move around to the 'R' and try and find as many words as you can starting with R. And so on around the wheel, until you try to find as many words as you can starting with the central 'E'. Some really methodical solvers take this method to the extreme by not just working round the letters in order, but then working around the letters next to that letter in turn! For instance, looking for words starting with V, you would then look for VR words (none) then VI words... yes there are some... so VIC words... yes: VICE... then VIN words... yes, VINO (depending on dictionary: informal word for wine) and certainly VINE. And, well, you get the idea: this exhaustive approach is sure to find all the words, so if that's your aim you might like to try it - for others the pleasure comes from casting their eye haphazardly and just seeing what comes to mind. At the back of the book we've suggested a list of words, and on each occasion these will get you beyond the excellent target. You may well find words that we haven't listed, because we never give an exhaustive list - we believe that half the fun is finding words we haven't given, and not just obscure ones too, so we always give a very good selection of word available for each puzzle, but not all of them. Enjoy the wordwheels, we hope you have fun working your way round the wheel, whether you decide to go clockwise, anti-clockwise, or haphazardly!